Agua Fresca is the original flavored water! But this water is free of added sugars, colors and preservatives. Just water and natural flavors from fruit. It’s also delicious! It’s simple: Take your favorite fruits and cut them into thin slices. Place in a pitcher, then fill the pitcher with water. When the water is gone, full it up again. The fruit will last for several fill ups. Don’t forget to check out our Cinco de Mayo giveaway page! You could win a $25 amazon.com gift card or a tortilla press! 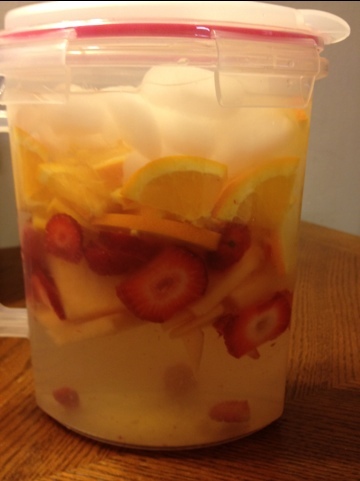 Tags: agua fresca, agua fresca recipe, Cinco de mayo, drinks, flavoring water with fresh fruit, fresh fruit in water, fruit, how to flavor water with fruit, how to make agua fresca, how to make natural vitamin water, how to make water taste better, recipes, water. Bookmark the permalink.